If you can’t leave your furry friend behind when you’re going away on holiday, you should know how to take care of them when going abroad. Here are some handy tips that will be helpful for your travel. If you’re flying, make sure to know the requirements set by the airline. Call or send them an email beforehand if you need to clarify any of the conditions specified. If it’s going to be a fun road trip, it’s necessary to schedule and map out the stops for bathroom breaks. Use these stops to let your four-legged friends run around, which helps to prevent them from becoming restless. Additionally, before going on a long journey with your pet, you should know what the experience entails. Test it out by taking a 2-hour drive to see if they are likely to develop motion sickness. This will help you plan out the longer drive better. It will also acquaint them of the conditions and will make them feel more comfortable about the journey. Take this a bit further by giving them treats as a reward every time they get in the car to create positive association with traveling. Although the idea of locking up your beloved pet sounds awful, it is necessary for safety. Letting them roam around freely inside a vehicle while you’re on the wheel could be distracting and dangerous. Research have shown that putting pets inside a crate can also reduce their anxiety during long distance travel. No matter how well your pet is house-trained, traveling can make them feel unsettled, which can cause little accidents. Keep puppy pads handy wherever you go! Unfamiliar surroundings can be scary for your pet. In case of an emergency, it’s best to bring a collar with tag that includes your contact information. When you’re away on a holiday, the last thing you need to worry about is refilling your pet’s medication or finding their favorite food. To avoid this, pack enough of the best great Dane dog food for the length of your vacation. Don’t rely on buying food at your destination. Make sure to bring their favorite toys and blankets to soothe them during your journey. A first aid kit is a must-bring too! Get them in for a full check-up before going on vacation. 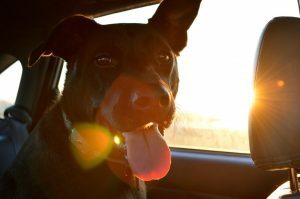 If your pet is likely to experience motion sickness, your vet will be able to prescribe something that will ease the sickness during the long drive. Take advantage of your visit and ask any questions that come to mind. With careful planning and preparation, you can enjoy and have the time of your life with your beloved pet!